Crimea's reconnection with Russia now poses the question of what to do with the large numbers of Ukrainian military personnel on the peninsula, as well as the ships and hardware belonging to the Ukrainian armed forces. The Republic of Crimea and the city of Sevastopol have returned to Russia. It has already been announced that local public sector employees will be paid the same salaries as their colleagues in other Russian regions, that veterans' pensions will more than double, and that local schools and universities will switch to Russian curricula. Many positive developments are expected in the republic, although some serious problems remain too. One of them concerns the fate of officers and warrant officers of the Ukrainian armed forces who served in Crimea. On the one hand, Kiev is issuing orders for them not to desert their military units and even, if there is threat to the life and wellbeing of servicemen, to open fire. On the other, some politicians in Kiev have called for the withdrawal of Ukrainian military personnel from Crimea and for the peninsula to be made a demilitarized zone. It has been reported that Ukraine is preparing a proposal to that effect to be submitted to the UN Security Council. What will happen to Ukrainian servicemen? 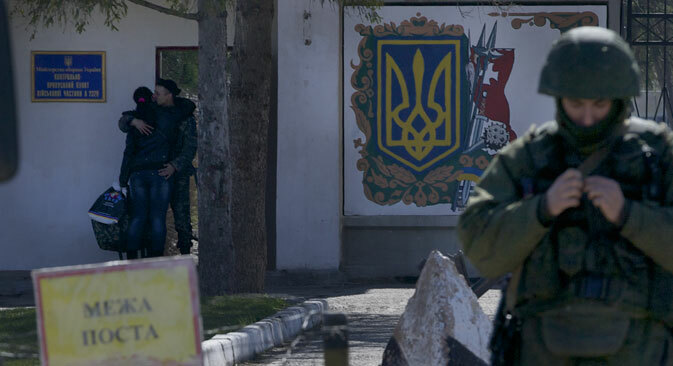 The Crimean authorities have made it clear that Ukrainian servicemen on the peninsula, of whom there are more than 20,000, have two options. The first is to quit the Ukrainian Armed Forces and join the Crimean self-defense forces, in order to later become servicemen of the Russian Army and the Black Sea Fleet. This option allows those who choose it to retain their military ranks and to receive far better pay than they got in the Ukrainian army. Military sanctions against Russia: Who stands to lose more? The other option, for those who do not want to serve Crimea and Russia, is to move to Ukraine. The Crimean government is ready to pay them three-month salaries and buy a train ticket on their behalf to wherever in Ukraine they would like to go. However, there is a serious obstacle to putting this option into practice since no Ukrainian officer or warrant officer can leave their unit without receiving an order to that effect from Kiev. Otherwise, they would be considered deserters, with all that the term implies. Is there a way out of this situation? There is. The Crimean authorities must present each such officer or warrant officer with a notification of deportation as a representative of another country's army whose presence on the peninsula is now illegal. This document should save the officers from prosecution in Ukraine. In fact, Ukrainian servicemen (with the exception of conscripts) have another option too. Those who do not want to serve either in the Russian or in the Ukrainian army can write a resignation letter and quit military service altogether. This option is likely to be used by those who have housing in Crimea and who have served the minimum number of years required for a pension, which they are guaranteed by Russian law. What will happen to Ukrainian military hardware? In addition to the servicemen, there is quite a large number of pieces of Ukrainian military hardware left in Crimea. These include, according to various estimates, at least 30 warships and auxiliary vessels, some 150 APCs and 50 tanks, 60 MiG-29 fighters and L-39 trainer aircraft, about 20 helicopters, some 60 S-300 surface-to-air missile systems, and about 40 Buk-M1 and Tor medium- and short-range surface-to-air missile systems as well as coastal defense systems… It is hard to say whether all this "legacy" will be of use to the Russian Armed Forces. Ukrainian armaments and military hardware, including those deployed in Crimea, have not been upgraded or replaced for the past 20 years. According to Ukrainian military pilots themselves, out of the 40 MiG-29 fighters based on the Belbek airbase outside Sevastopol, only five are still flightworthy. The condition of Ukrainian naval and auxiliary ships is another story. At the moment, most of these vessels are trapped in Sevastopol’s bays. For instance, exit from Strelets Bay is hindered by a pontoon and booms that are blocking the corvettes Ternopol and Lutsk, the command and control ship Slavutich and Ukraine's only submarine, Zaporozhye. A number of ships are moored at the Yuzhnaya naval base on Lake Donuzlav near Yevpatoria, meanwhile. These include the large amphibious ship Konstantin Olshansky, the medium landing ship Kirovograd, the corvette Vinnitsa, the transport ship Gorlovka, the minesweepers Chernigov and Cherkassy, the harbor minesweeper Genichensk, and a dozen more vessels. They cannot reach open sea since their path is obstructed by two old ships that have been deliberately sunk to block passage. These can of course be lifted to the surface, but that would require considerable time and money. It also raises the question of who will pay for it. If Moscow decides to return the blocked ships to Kiev, then the associated costs would have to be borne by the Ukrainian Navy, while if the vessels remain in Crimea, then the Russian Black Sea Fleet will have to foot the bill. At the very least, all this will be subject to negotiations. However, after the seizure by the new Ukrainian authorities of several dozen Russian KamAZ trucks intended for Kazakhstan, the future of the Ukrainian ships locked in Sevastopol bay is not as clear as it may seem. It should be noted that some of those ships are rather old and are in need of serious repairs and modernization. But these matters can be addressed only after the fate of the vessels has been decided. Read more: Will the Ukrainian conflict turn hot? As to where these ships, as well as those of the Russian Black Sea Fleet, can undergo repairs, that should not be a problem. Crimea has several quite decent, albeit rundown, ship repair and shipbuilding facilities, including shipyard No. 13 in Sevastopol, Zaliv in Kerch and More in Feodosiya. However, the Sevastopol plant, which formerly employed 12,000 people, now has a staff of just 200. Until recently, it did not even take commissions to repair Black Sea Fleet ships, so the Russian Navy had to have its ships repaired in Bulgaria, which had become a NATO member. Incidentally, the quality of the work done by the Bulgarians was far superior to that of their Crimean counterparts. Now that salaries and wages on the peninsula are expected to rise to the average Russian level, one might hope that Crimeans' attitude to work will change too.